René Adam is President of the Medical Board of the Paul Brousse Hospital, Villejuif, France and Head of the Oncological Surgery Unit of the Hepato Biliary Center at the hospital. Since 1994, he has held the position of Professor of Surgery at the Faculty of Medicine Kremlin Bicêtre at Paris South University, Paris. Professor Adam’s main fields of activity and research are surgery of the liver, biliary tract and pancreas, and hepatic transplantation. He is particularly involved in the treatment of hepatocellular carcinoma and of liver metastases. Professor Adam has been General Secretary and is currently Treasurer of the French Association of Surgery; he is a board member of the French Association of Hepato-Biliary Surgery and Liver Transplantation. He chairs the European Liver Transplant Registry and LiverMetsurvey, the international Registry of Colorectal liver metastases. 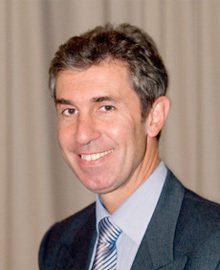 He is on the Editorial Board of The Oncologist and member of several international societies, including the American Society of Clinical Oncology (ASCO), the European Society of Surgical Oncology (ESSO), the European Society of Organ Transplantation (ESOT), the European Surgical Association (ESA) and the International Hepato-Pancreatic and Biliary Association (IHPBA) . Professor Adam has delivered more than 600 lectures on his research interests around the world, and has more than 200 publications in peer-reviewed journals. Adam R, Pascal G, Azoulay D, Tanaka K, Castaing D, Bismuth H. Liver resection for colorectal metastases: the third hepatectomy. Annals of Surgery 2003 Dec;238(6):871-83; discussion 883-4. Adam R, Del Gaudio M. Evolution of liver transplantation for hepatocellular carcinoma. Journal of Hepatology 2003 Dec;39(6):888-95. Adam R, Pascal G, Castaing D, Azoulay D, Delvart V, Paule B, Levi F, Bismuth H. Tumor progression while on chemotherapy: a contraindication to liver resection for multiple colorectal metastases? Annals of Surgery 2004 Dec;240(6):1052-64. Adam R, Lucidi V, Karam V. Liver transplantation in Europe: is there a room for improvement? Journal of Hepatology 2005 Jan;42(1):33-40. Adam R, Chiche L, Aloia T, Elias D, Salmon R, Rivoire M, Jaeck D, Saric J, Le Treut YP, Belghiti J, Mantion G, Mentha G; Association Francaise de Chirurgie. Hepatic resection for noncolorectal nonendocrine liver metastases: analysis of 1,452 patients and development of a prognostic model. Annals of Surgery 2006 Oct;244(4):524-35.